Alwa’s Awakening is an NES-inspired platforming-focused side-scroller with plenty of exploration and a little bit of puzzles and combat. You play as Zoe, a girl who was sent to a world controlled by an evil overlord called the Vicar. Armed with a staff and, eventually a few magic spells and items, you are tasked to recover all the relics in the world and defeat Vicar. Almost everything in Alwa’s Awakening was designed to be like an NES (or Famicom) game, from the way it looks to the harsh game play designs. Among all these, the graphics and the music is definitely the highlight of the game. I personally did not own an NES when I was young, but the NES-style graphic here is as charming as ever. The chiptune music is also very catchy and atmospheric. The world of Alwa’s Awakening is moderately sized, so there is plenty to explore. However, Zoe moves very slowly, which makes exploring and backtracking a bit of a chore. (The developers released a patch after release that lets you respawn at the beginning of the room you died in, rather than at the save point - which definitely helps a lot.) There are also invisible walls and plenty of hazards that instant-kills - which is really frustrating to me. What is fun about the exploration is the two spells that you eventually get that creates blocks (that you can stand on) and creates bubble (that you can bounce on). These can also be upgraded further along the game, which lead to greater flexibility - and, of course, get you to new locations. 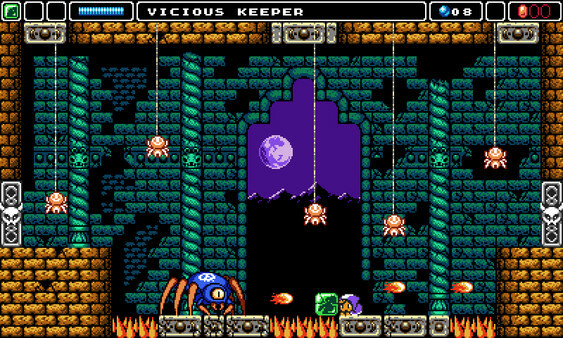 This game is really a platforming-focused game rather than a combat-focused game, but you are equipped with a short-staff from the very beginning, which can be used to bash enemies in close range. Eventually you will also get a lightning spell which can both hurt enemies and break some specific walls. That said, I think most combat in this game, both bosses and mobs, are primarily about avoiding attacks and death-traps. I am personally not very good at (nor a huge fan of) platforming, so Alwa’s Awakening was often too frustrating for me. The exploration is fun, and the charming music and graphics definitely carried me through my playthrough, but I am not sure I would revisit it anytime soon.